We eat from the garden so few crops are harvested "all at once." I struggle a bit trying to decide what successions will work well in the local climate. One fly in the ointment is the fact that in many cases mature plants still standing in the bed would completely overshadow any seedlings intended to replace the one(s) just harvested. As an example of a harvested crop followed by a different one, Cauliflower, set out mid-April here, could be followed by Kohlrabi that can be started up to mid-July. However coming up with a big plan that will make the best use of all my space is quite a puzzle. I'm interested in hearing what follows what in your garden; bearing in mind that what works in one zone may not work in another. How do others among you achieve "successful successions?" We eat from the garden too and fill the kitchen pantry with 1 years worth of food by July. Spring is easy to get plants started here in Tennessee we have lots of rain, rain almost every day for 3 months. Plants are much harder to start in August in 98 degree weather with not much rain. There are fewer bugs in spring they have not been born yet that makes gardening easier too. I know from 40 years of gardening Tomatoes do good until it gets HOT about July they starting suffering very bad in the hot sun so I plant 20 tomato plants so we have 100 mason jar pints in the pantry for winter before plants stop making tomatoes. I like to plant 500 corn seeds so we get 500 ears of corn from our garden I planted 72 day corn this year. I planted 350 bean seeds we had more beans than we needed so I saved some for next years seed. I usually save 3 or 4 ears of corn for next years seed too. I save tomato seeds too but I buy tomato plants in trays at the garden store to plant in April but I plant seeds in the garden for replacement plants just in case a few plants die they can be replaced from seed plants. Next year i will have a 3 ft wide row of potatoes 35 ft long, a 3 ft wide row of onions and garlic 35 ft long. My pepper plants never make anything until late Sept they were planted in May it is too hot here so they make nothing until cooler weather. Each pepper plant will make 30 to 45 peppers before frost kills them about Nov 1st. Years ago I tried to plant a succession garden it is just too hot in August seeds will not germinate in 95 degree heat, if I plant seeds in trays inside the house I have to water plants every day for 3 months to keep them alive that is too much work. I do dry gardening I never water my plants that forces them to grow deep roots in search of water in preparation for hot summer weather. Your in Canada you will probably have a much easier time than me doing succession gardening except your growing season is about 3 months shorter than mine. Our last frost is usually about April 15 to 20 and first freeze about Nov 1 to 7. We have different bugs and more bugs in Fall than spring. My goal every year is to see how much I can grow by July 15. I want 1 year supply of food in the pantry by July 15. If the garden continues to produce we eat from the garden not the pantry. My garden is 35ft x 60 ft. I never see many bugs until July, I have 12 bird houses that is very helpful for getting rid of bugs. Gary, thanks for a very full reply - even if your response to my query about succession planting is more or less "Don't bother!" The amount you produce has me in awe. Our frost free season is certainly shorter than yours and our growing season even shorter than you might expect because of sudden hot summers following cold wet springs. Early peas for example are liable to rot rather than germinate. I once took great pains to nurse a row of them into life in mid February ("as soon as the ground can be worked.") They grew very slowly and matured at exactly the same time as an identical row planted a full month later . I'm not familiar with dry land gardening. Can you enlighten me a bit, or point me to some good information? Do you take vacations? We don't do winter holidays and it's tough to reconcile 2 weeks absence in summertime with harvesting and, to some extent, planting. Those peas won't wait 2 weeks to get picked! Vanisle_BC wrote: Gary, thanks for a very full reply - even if your response to my query about succession planting is more or less "Don't bother!" I know exactly what your talking about plant 2 crops of peas and have both crops harvest about the same time. I planted 75 onion bulbs this year 3 different times starting about April 15, May 1st and about May 15. The May 15 crop was better than the other 2 crops combined. LOL. We are retired, we go camping every Tuesday to Friday or Monday to Thursday of every week from mid March to mid July. It is too hot in July it is not fun to be camping in 100 degree heat. We are going to start camping again this Thursday and return home Monday evening. I rarely have grass or weeds in the garden so I don't need to be here until harvest day. I don't do mulch and don't do plastic or any other type ground cover. Many years go I decided if there are no seeds in the garden then no weeds or grass will grow. I start tilling soon as I can and usually till maybe every other day the objective is to kill every seed that germinated and stir more seeds to the surface so they will germinate so the tiller can kill them. I look at the soil if plants are starting to grow I till again. Soon as i see nothing trying to grow it is about time to plant the garden. DRY FARMING is something my Grandfather taught me 50 years ago. Watch the weather when it gets right no more frost and forecast says rain tomorrow, plant your garden 2 hours before sun dark. If it rains for 3 days all the seeds germinate and plants grow. Spring brings more rain that slowly goes away by the time 80 degree weather is here plants already have a good root system. When 90 degree weather is here plant roots are much deeper. When 98 degree weather is here and no more rain plant roots are deep enough they have their own water supply hot weather will not hurt them at all even if there is no rain for 3 months. The worse thing you can do to your plants is water them it makes them grow surface roots that become dependent on your water. I grow some greens in spring, Kale, chard, broccoli, bok choy. I plant tomatoes very deep April 15 the whole plant turns into a big wad of roots in about 5 days the plants start growing about 10" taller every week. I plant corn, beans, onions, garlic, potatoes, tomatoes, water melons, cantaloupe, peppers, squash, okra, sweet potatoes and maybe a few other things. I don't plant seeds until my thermometer shows soil temperature is 65 degrees. We have crazy weather here I planted seed this year 3 times, first time I planted next day we had flash floor rain for a week and it turned cold not many seeds germinated. I planted again the same thing happened flash floods and cold weather not many seeds germinated. I planted seeds again this time they grew. My garden was about 1 month late getting started but it still did good. I was going to try and do a fall garden again this year mostly greens, kale, chard, bok choy, broccoli, but it is just too much trouble to water every day to keep it alive. We are going camping in 3 days and won't return until Monday. This is good camping season we want to take a 3 week trip to Colorado 1200 mile drive maybe a few days after this upcoming camping trip. If Canada is not hot and dry now it should be ok for you to plant a garden now. The only reason I don't want to do another garden now is because I don't want to miss any good camping, I don't intend to be home very much. I have a lot of seeds planted in plant trays I guess I will plant all these plants anyway if they die because I was not here to water them, Oh well. I think sometimes, key to succession planting is in the planting patterns utilizing ALTERNATING space rather than SAME space. - Sometimes planting with just a little wider spacing and planting/sowing quick maturing crops between longer maturing crops to make use of the space before the longer maturing crop needs/takes over the space. - Sometimes it works to plant in such a way that first sowing/planting/wave of a crop will mature and are removed entirely, leaving the space bare for the succession crop. - Sometimes it works to start/sow the next crop just BEFORE the previous crop is harvested in the soil underneath the canopy. But this is best done with crops that can be side-dressed after the previous crop is removed -- and by removed I mean cut down at soil level rather than dug up. A lot of it has been trial and error, and the weather patterns often play a part in success and failure. https://www.helpfulgardener.com/forum/ ... 79&t=71873 has more details and pictures. Bed 1: Planted with spinach down the long edges early. Put tomato plants down the middle and pepper plant at one end basil at the other. Tomatoes and peppers are still hanging in, but the spinach is long gone. Just planted peas down the edges. Bed 2: Had parsley and garlic over wintered from last year. Spring planted with lettuce down one edge, then added tomato plants in the middle. Now has beans down the edges and two pepper plants on the end. Bed 3: Had peas, broccoli, chard, and kale. Now has beans, squash, and new baby broccoli seedlings. Bed 4: Had overwintered parsley and garlic and spring planted with cabbage and carrots. Now has beans and carrots and basil. 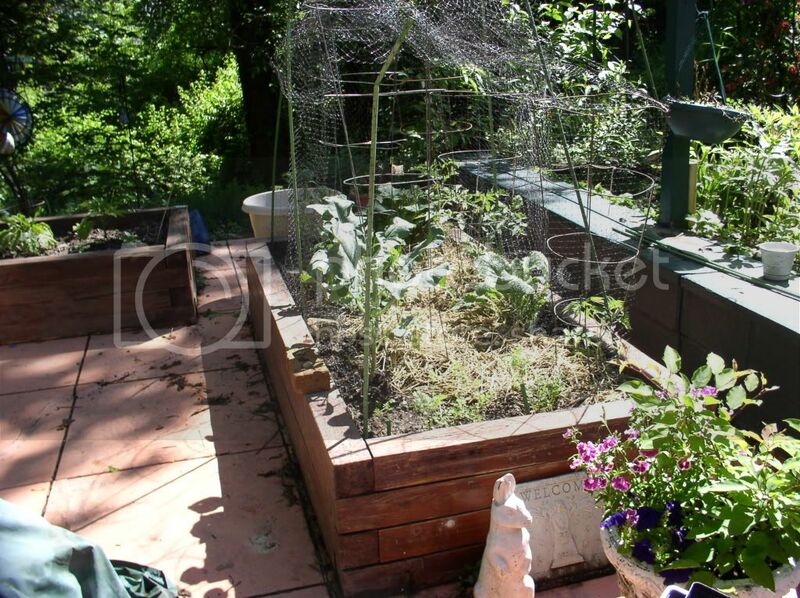 Bed 5: (4x4 in the center of the garden) had carrots and corn. Now has some remaining carrots, beans, a volunteer potato plant and a volunteer tomato plant. Quarter circle 1: (it was well into spring before I finished building this one) had corn and squash. Now still has squash, but planted broccoli seeds in the middle where the corn was. Quarter circle 2: perennial bed: asparagus, strawberry, rhubarb, artichoke. All of this stuff stays where it is and doesn't get disturbed. Bed 6: (at the end of the deck) had potatoes and broccoli. Just replanted with chard and spinach seeds that are just sprouting. Unlike applestar, I don't have any plan for this. I just see what spaces open up and plant what is timely at that point in the open spaces. When the tomatoes, beans, etc. are finished, I will fill in the spaces with more cold weather stuff including lettuces and garlic and onions. Probably plant more spinach. Depending on when the new broccoli is done, I may replant it to over-winter. So there is always something going on in my garden. This year, I am going to try covering some of the beds to keep stuff going all winter. Over the course of a year, one bed may have four different plantings in it. One of my "tricks" has always been planting cold weather stuff down the edges of beds as early as possible, leaving some space in the middle. Later in spring when it is warm enough, I plant tomatoes down the middle. By the time the tomato plants are getting really big and need the space, the cold weather stuff is done. Since I can technically garden all year, I am getting ready to start my fall garden. I have the garlic chilling in the frig. The turmeric is blooming and will be going down in a month or so. The Ginger will probably bloom ealy too. I have cucumber now and some swiss chard, perpetual spinach and beets. I need to clean my bench up so I will have room for the green onions,chives, leeks, kale, basil, and Asian green (tatsoi, bok choy, daikon, and mizuna. I am going to try to start more peppers. It is still warm enough, I hope there will be enough daylight. I have made cuttings of bay leaf, roses, mini bozo, citrossa, euphorbia cotinifolia, ohia lehua, and lavender. I am getting ready to start planting more basil, thyme, sage, kale, and maybe some Asian greens, eggplant,beets, and I might try gobo. ( I haven't tried that for a while) for the October sale. I do succession planting with cucumbers, as I get too many from more than one plant - the first time I grew them in SIPs I got over 90 from 3 plants, then, nothing! So this year, I planted some 3 weeks apart, but next season I'll go for 4 weeks apart, as they overlapped a bit much, with the earlier one still producing a generous amount, while the new one is starting to fruit. Right now, I have the last one out there, only about 2 feet tall, but beginning to flower, so I'll find out if I get any from it. Kohlrabi is one brassica that I succession plant, but only one time, as in both spring and fall I can only get about two crops, before it gets too hot or too cold. About 3 weeks apart is good for them in my area. All gardening is local, Vanisle_BC. You will have to try different ideas and see what happens. I do the spring interplanting but not as much since the tractor guy has become somewhat of an adversary in leaving beds more intact and not requiring so much work from me to gather soil in those beds with paths between. Later sowings: bush beans are an easy choice in my garden if I can get them in anytime before late June. Even with a lingering spring, lots of salad veggies can be out of the way by then. I don't usually use the cut-and-come-again method for lettuce. Older plants don't do well once real hot, dry July weather arrives. However, there may be a number of times the lettuce plants have been set out, including fairly late spring. They are nearly all harvested by taking out the plant. That is an easy location for beans. Beans also follow the peas vines. Peas can make a return to the garden in late July, although the seedlings won't really like the conditions until late August, when a cooldown in the weather usually occurs (not this year!). They can follow the potatoes and I only grow early varieties of potatoes. Consistent winners on the potato ground are Asian greens. That seed can go in until about August 10th. Once again, little growth occurs until there is some cooler weather but both the pea seed and Asian greens germinate well and get a start. Back at the first of July, zucchini and cucumber plants were set out between the early cabbage and broccoli. Usually, there isn't reason to keep the broccoli after the secondary buds have been harvested and those develop soon after the central head is harvested. Early cabbage is early . In the few weeks that they are together, the brassica plants shade the summer squash and cukes. The spring squash plants may have mildew and they and the cukes are beginning to play out by September. Those cucumbers and squash plants started July 1 are just now beginning to produce! Vanisle_BC wrote: However coming up with a big plan that will make the best use of all my space is quite a puzzle. I read your post again, best use of garden space is what you want. The old way to garden was plant in rows about 3ft apart. The new way to garden tends to be wider rows = beds. I use to plant 5 rows of beans 3 feet apart that takes up 15 feet of garden space. Now I plant 7 rows of beans in a 3 foot wide space, rows are 6" apart. This gives me a 3ft wide row 35 ft long. Beans do not seem to care if they are crowded they do good anyway. I use to plant corn in rows 3 feet apart, I have don't a lot of experiments over the past many years, planting corn with 6" to seed spacing, rows 12" apart in a square block 15'x15' does very well and gives you 16 rows with 31 seeds per row = 496 ears of corn. This compact spacing is very hard to weed, it works better with a 72 day corn than a 90 day corn. 72 day corn gives you time to pull out the old corn and plant a new crop. 2 crops = about 1000 ears of corn for the summer season. I have also planted corn and beans together, corns seeds 12" apart with 3 beans between each corn plant. I use to plant onions, garlic, potatoes in rows 3 ft apart now I plant 7 rows, 6" apart in a 3 foot wide bed 35 ft long onions and garlic. Potatoes need to be spaces about 12" apart. I use to plant, Kale, Broccoli, Chard, Lettuce, other greens in rows now they work best planted in a 3 ft wide bed = row 35 ft long. You can mix these crops all together in the same row. You can plant, peppers, tomatoes, corn, in double and triple rows. Peppers do good planted 12" apart with 3 rows 12" apart. Corn does good with double rows 12" apart with 32" between the double rows. Tomatoes do good in triple rows 18" apart the center row is hard to find and harvest the tomatoes. Plant melons, sweet potatoes, squash is 10 ft wide rows, keep all the vines in the row. You can plant water melons, cantaloupe, squash side by side 10 ft wide row 35 ft long. I could have planted another crop for corn this year after the first crop but I didn't. We had all the corn we needed. My garden is wasted space this time of the year dry as desert it needs water for new plants to grow but old plants with deep roots do fine. I think succession garden will work for you plant short crops over and over in the same place. When I lived in Michigan growing season was very short last frost was about June 6, first frost was about Sept 15, growing season slightly more than 3 months. Do you have a garden tiller? Buy a narrow tiller it works best for closer row spacing. I have a 20" and 24" tiller. I use the 24 to till the whole garden. I use the 20" to till between rows. There is a company that makes a 16" wide tiller. You could do 28" row spacing with a 16" tiller and still do 3ft wide rows and beds. When I had a smaller garden space I did 32" row spacing. I don't grow the wide variety of crops as some of you do. we started, as an experiment really, with the 4 things we use the most. beans, potatoes, tomatoes, and cucumbers. over the years, as the garden expanded, we added other things..corn, beets, cabbage, brussel sprouts, peas, onions, okra and several kinds of shell beans. here in the western Virginia hills, I can start planting, most years, late april and first frost is usually late October. I do follow on second cropping to make the most of the growing season. the peas and beets are followed by shell beans, red, black, navy or pinto, depends on what we need. green beans I plant 2 rows every week for 4 weeks. that way I am not over whelmed with 8 rows to pick every night for a week or so, then nothing. if I need more, I can replant the first two rows when the first crop is done. red beans usually come in soon enough to follow on with pintos. as long as the seeds have set, it doesn't matter if they get frosted, they will make a crop. if a spot is going to sit for a couple of months, I try to plant a cover crop..oats is first aid for the soil, and wheat and buck wheat is good for over wintering. a bit of a pain to harvest and process without special equiptment, but doable, and good for the soil. I was reciently gifted a troy built pony. it didn't run, and turns out it was built in 1961....so parts are getting hard to find. I had to replace the ignition coil with an up grade and rebuild the carb. I am into it about $75 and it runs. it has 16 inch tines, and adjustable depth. it won't deep till, the engine is just not strong enough any more, but set to shallow, it will be a great cultivating tiller. next year I plan on 4 foot wide rows with 2 foot walkways, so a pass down the walk way once a week or so with the tiller should keep them weed free. every year we try something new. if it works and we like it, we grow it again, if not we don't. okra was added, parsnips, not. next year we are trying butter/lima beans. There's a lot to digest in those replies to my query about succession planting. As for ourselves, I work mostly in 3'-6" wide beds raised 16" with sides I can sit on. Don't have a tiller. I don't think dryland techniques would work in my well-drained beds; especially the tomato beds which have poly roofs to guard against late blight (Don't ever want that again). They must be constantly watered at ground level. I guess we're oddball in that we don't eat much corn or many kinds of beans. Not growing those eliminates some opportunities for succession or interplanting. We also don't try to produce nearly as much food as some of you do. I grow things at fairly tight spacing, sometimes closer than Gary suggests. Garlic I do at 4x5 inches. A disadvantage of close rows is you can't run a 7" hoe/swoe down a 5" space. I once tried planting garlic in wider-spaced "clumps" - 4 seeds every 12" in rows 12" apart - but the results weren't great. Still I suspect many plants could be grown in clumps - leeks, broad beans? I grow a double row of trellised dwarfish peas across the ends of most bed sections. I'd like to grow a lot more peas - those, tomatoes & garlic are our most savoured crops - but having to get between pea rows to harvest, means they would take up a lot of space. Is it the space becoming available from the garlic harvest in (what?) mid-July that you are hoping to make better use of, Vanisle_BC? It should lend itself to a use for peas. I think that I have grown garlic twice in my life ... It isn't that we don't value and use garlic, it's just that we use so little of it. It's available to buy and stores well. We make up for its absence by growing lots of onions and shallots. My July planting of pea seed isn't a very big deal. I have snow, snap and shell peas in the spring. I begin to miss them during these dry, hot weeks. The young plants don't grow much in August and the snow peas I usually grow can take a frost without perishing but it will burn the flowers. The plants will slow and may just sit there after 1 or 2 frosts. I learned to enjoy the tendrils and will harvest a few for dinner even if the weather isn't threatening to shut down the plants. However, I wouldn't bother with them if there wasn't a reasonable expectation of pods to harvest. I should say that I have tried to grow lettuce as a fall crop several times. It just has not worked! Seed germinates and the tiny plants just sit there until the dry, hot weeks are replaced by frosty mornings, then cold and snow. Nothing. Never large enough to harvest. So ... I go with the Asian greens and stir-fries. Finding something to follow garlic is one of my reasons for asking about successions, but I'm just generally interested in making the most of my space. Not sure why I grow so much garlic - a couple hundred most years - except it's so EASY. There isn't much else that gives me ~100% success, I can eat it all year and have enough seed left over for next season. Where I was born & raised, garlic used to be scorned. Now that I know better, we use it copiously. Peas would be a possible successor, but I've not so far had success with late plantings. Maybe it's tricky to find the right time-slot; not too hot but not too late/wet/cold. Out of 2 double rows of Maestro that I sowed early July, only 4 or 5 seeds germinated. Maybe if I'd pre-soaked ....? I think I read somewhere that you can overwinter peas even in places that get frost - or maybe I just dreamed that! I have noticed that Oregon Giant keeps producing when all my others have died. But it's those other sweet shelled peas that I crave when there are none left. As for lettuce I've been impressed with Winter Density ("grows in all weathers") but haven't really challenged it to live up to the slogan. Are those red cedar boards? Dimensional lumber (eg landscape timbers, 4x4s ) lasts WAY longer than flat boards. The first raised beds I ever built were of boards. I used corner braces, middle braces and everything I could think of. Still in 3-4 years they were all warped and falling apart. At the time I moved away from that house, they had been there for about 14 years and were still going strong. I did recoat the outside every few years, mainly for cosmetics, but of course once the dirt is in, it's never going to get redone inside.